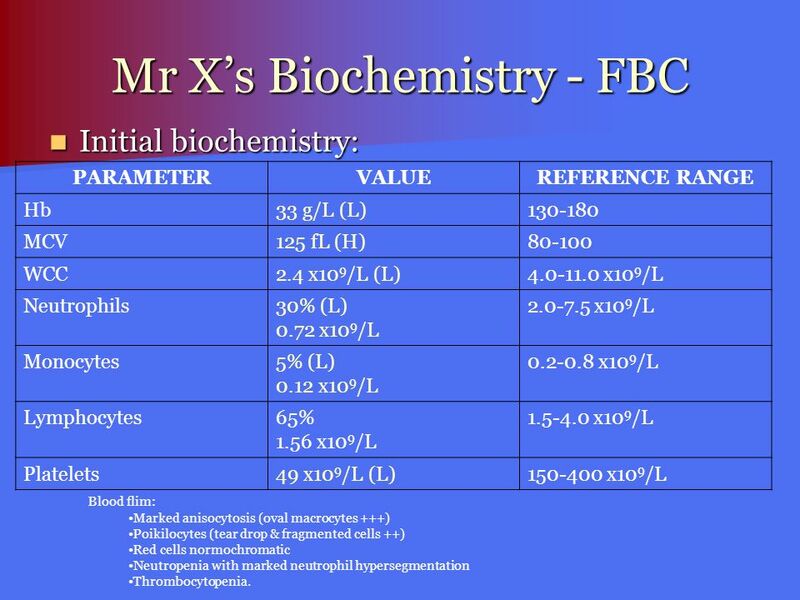 Initial biochemistry: PARAMETER VALUE REFERENCE RANGE Hb 33 g/L (L) MCV 125 fL (H) 80-100 WCC 2.4 x109/L (L) x109/L Neutrophils 30% (L) 0.72 x109/L x109/L Monocytes 5% (L) 0.12 x109/L x109/L Lymphocytes 65% 1.56 x109/L x109/L Platelets 49 x109/L (L) x109/L Blood film marked anisocytosis (marked variation in size between individual RBCs (oval macrocytes common in b12 & folate deficiencies) poikilocytes (abnormally-shaped RBCs) (tear drop & fragmented cells ++). Red cells normochromic Neutropenia (decrease in number of neutophils) with marked neutrophil hypersegmentation. 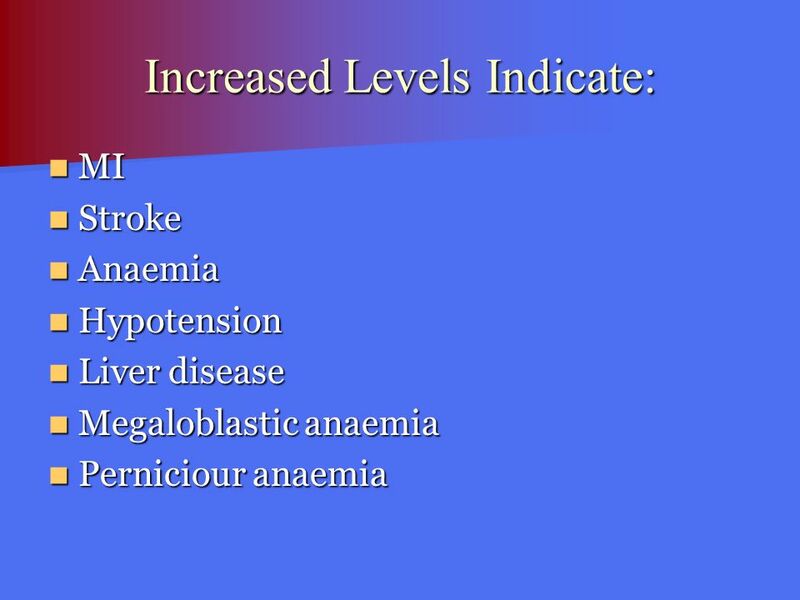 Thrombocytopenia (low numbers of platelets). Blood flim: Marked anisocytosis (oval macrocytes +++) Poikilocytes (tear drop & fragmented cells ++) Red cells normochromatic Neutropenia with marked neutrophil hypersegmentation Thrombocytopenia. 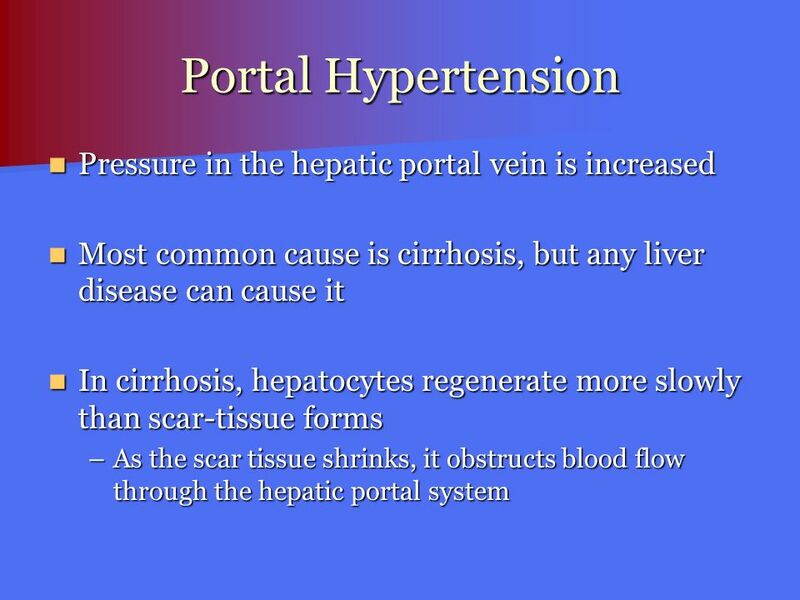 Most common cause is cirrhosis, but any liver disease can cause it In cirrhosis, hepatocytes regenerate more slowly than scar-tissue forms As the scar tissue shrinks, it obstructs blood flow through the hepatic portal system Patients with alcoholic cirrhosis and those with isolated alcoholic hepatitis may develop complications of portal hypertension Pressure in the hepatic portal vein is increased, causing enlargement of the spleen, oesophageal veins (which may rupture and bleed) & ascites (accumulation of fluid in the peritoneal cavity). Commonest cause is cirrohsis, but most liver disease can cause it In cirrohsis, the poisoned hepatocytes regenerate, however scar-tissue (i.e., connective tissue) forms more quickly  liver becomes fibrous As the scar tissue shrinks, it obstructs blood flow through the hepatic portal system, leading to portal hypertension. 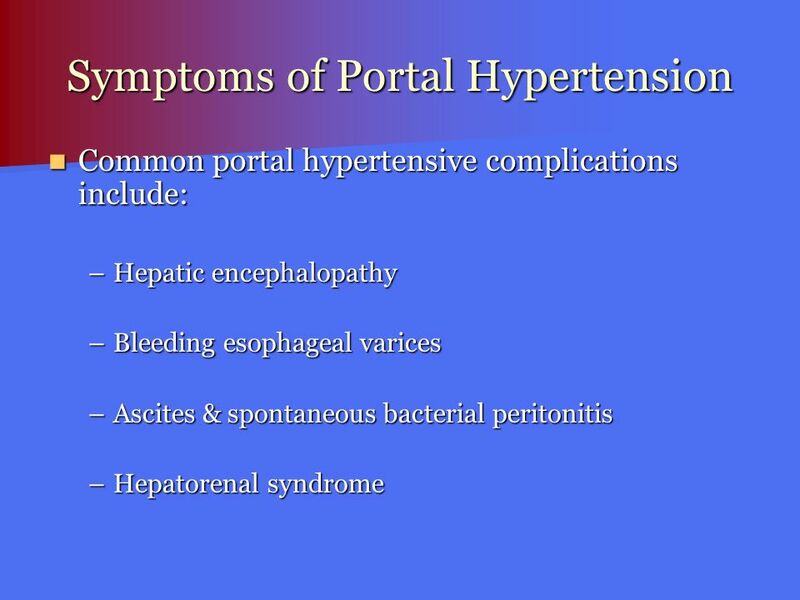 Common portal hypertensive complications include: Hepatic encephalopathy Bleeding esophageal varices Ascites & spontaneous bacterial peritonitis Hepatorenal syndrome Common portal hypertensive complications that require therapy include: Hepatic encephalopathy (toxins normally removed by the liver  impair brain function) Bleeding esophageal varices (dilated veins of the lower oesophagus due to portal hypertension) Ascites and spontaneous bacterial peritonitis (Accumulation of fluid in the peritoneal cavity  bacterial infection) Hepatorenal syndrome all of which portend severe disease and a poor prognosis. 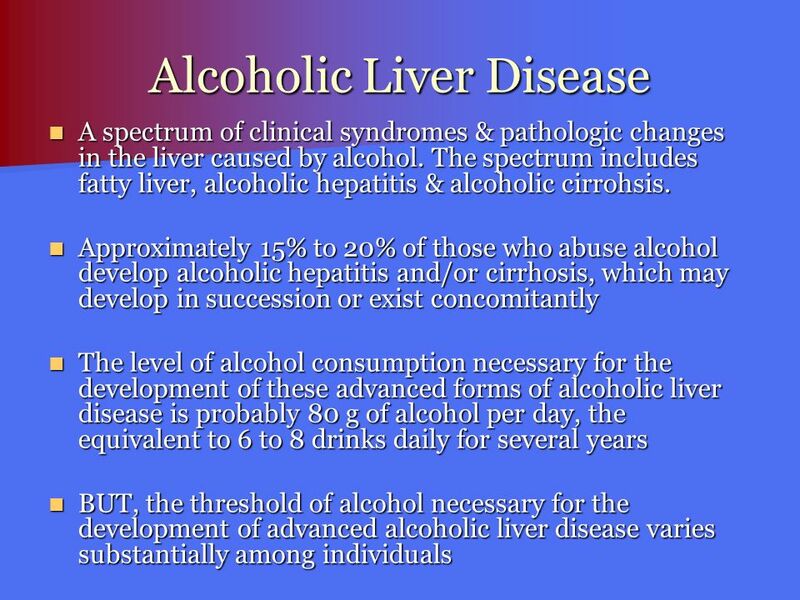 A spectrum of clinical syndromes & pathologic changes in the liver caused by alcohol. The spectrum includes fatty liver, alcoholic hepatitis & alcoholic cirrohsis. Approximately 15% to 20% of those who abuse alcohol develop alcoholic hepatitis and/or cirrhosis, which may develop in succession or exist concomitantly The level of alcohol consumption necessary for the development of these advanced forms of alcoholic liver disease is probably 80 g of alcohol per day, the equivalent to 6 to 8 drinks daily for several years BUT, the threshold of alcohol necessary for the development of advanced alcoholic liver disease varies substantially among individuals A spectrum of clinical syndromes & pathologic changes in the liver, caused by alcohol. 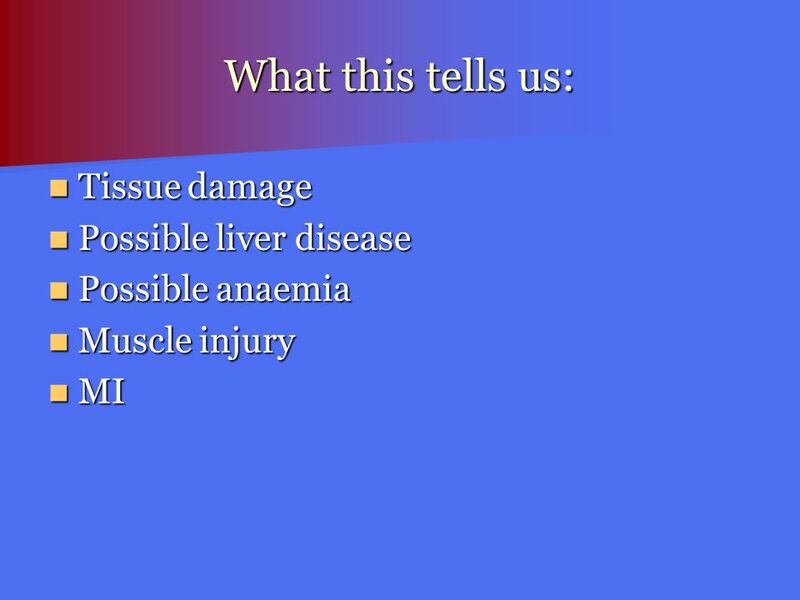 The spectrum includes fatty liver, alcoholic hepatitis & alcoholic cirrohsis. Approximately 15% to 20% of those who abuse alcohol develop alcoholic hepatitis and/or cirrhosis, which may develop in succession or exist concomitantly The level of alcohol consumption necessary for the development of these advanced forms of alcoholic liver disease is probably 80 g of alcohol per day, the equivalent to 6 to 8 drinks daily for several years  However, the threshold of alcohol necessary for the development of advanced alcoholic liver disease varies substantially among individuals, and factors other than absolute alcohol consumption clearly have an important role in determining who will develop alcoholic liver disease and who will not. 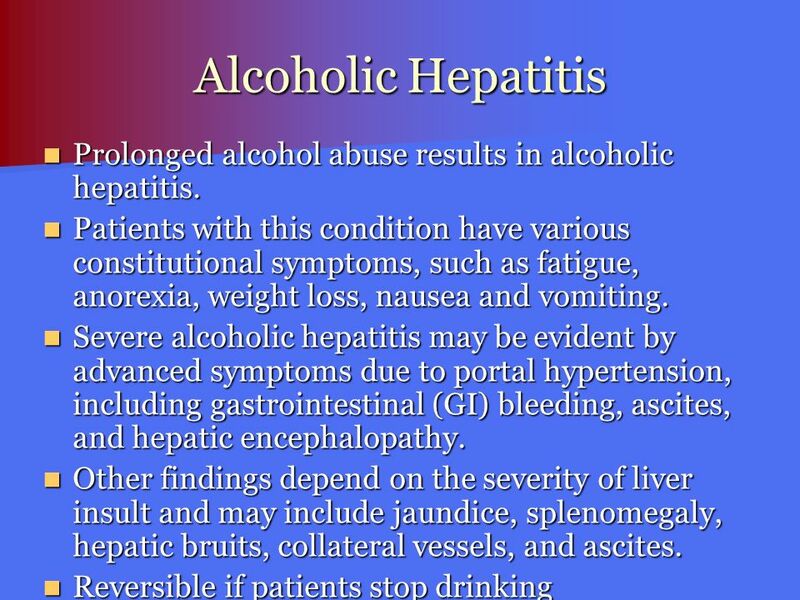 10 Alcoholic Hepatitis Prolonged alcohol abuse results in alcoholic hepatitis. Patients with this condition have various constitutional symptoms, such as fatigue, anorexia, weight loss, nausea and vomiting. 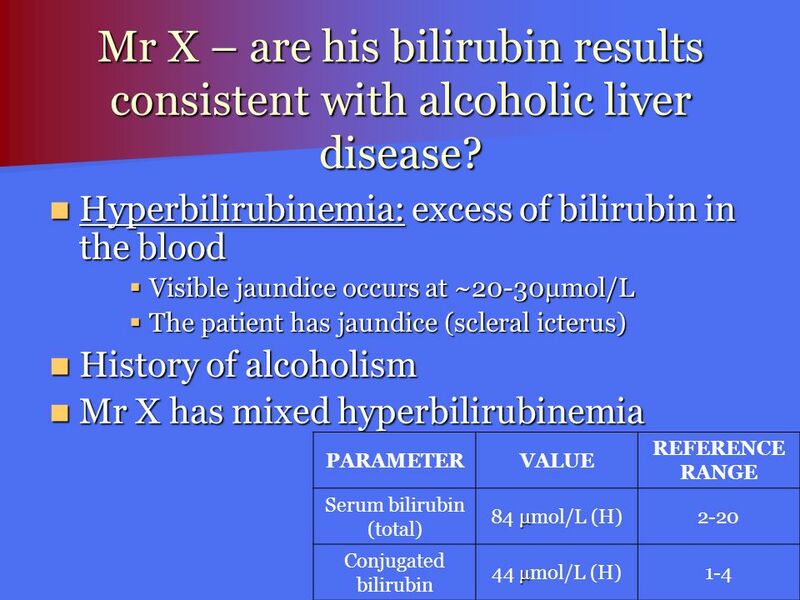 Severe alcoholic hepatitis may be evident by advanced symptoms due to portal hypertension, including gastrointestinal (GI) bleeding, ascites, and hepatic encephalopathy. 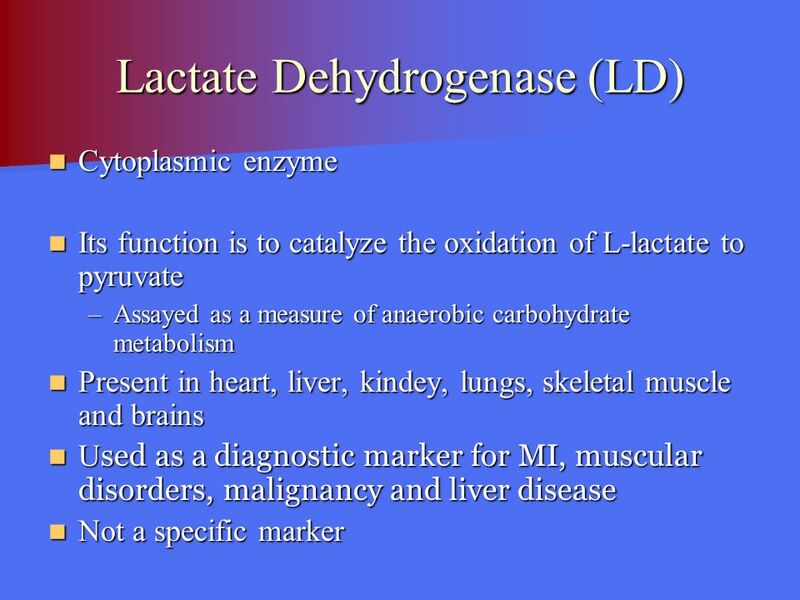 Other findings depend on the severity of liver insult and may include jaundice, splenomegaly, hepatic bruits, collateral vessels, and ascites. 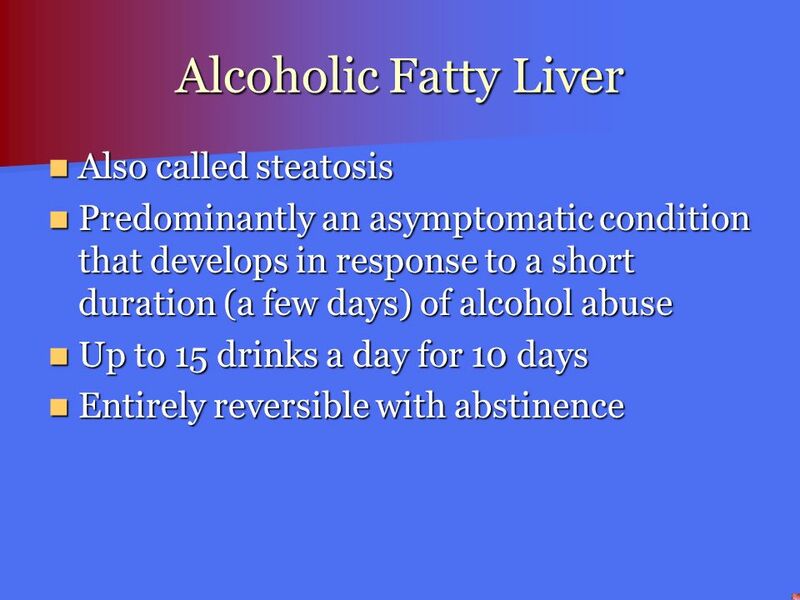 Reversible if patients stop drinking Prolonged alcohol abuse results in alcoholic hepatitis. Diagnosed predominantly on clinical history, physical examination, and laboratory testing, although liver biopsy is often necessary to secure the diagnosis. 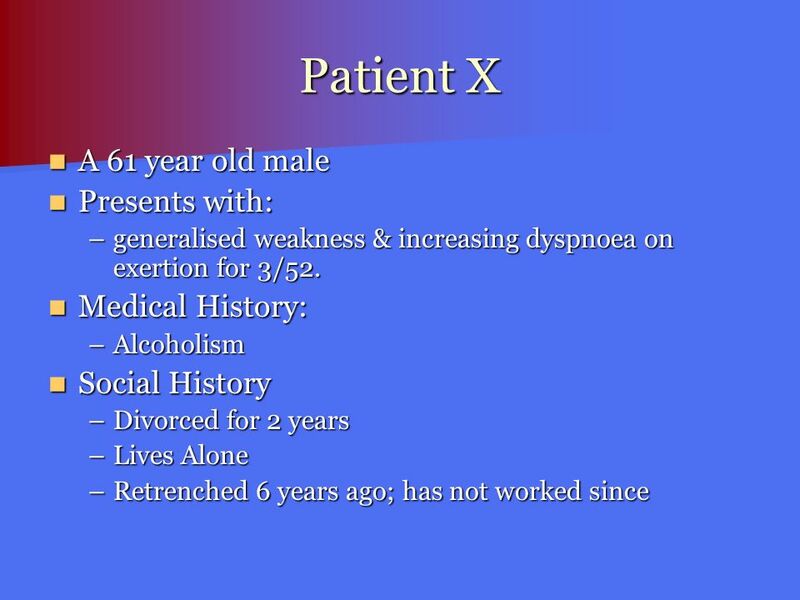 The history of patients with this condition is notable for various constitutional symptoms, such as fatigue, anorexia, and weight loss, and other nonspecific symptoms, such as nausea and vomiting. Severe alcoholic hepatitis may be evident by advanced symptoms due to portal hypertension, including gastrointestinal (GI) bleeding, ascites, and hepatic encephalopathy. 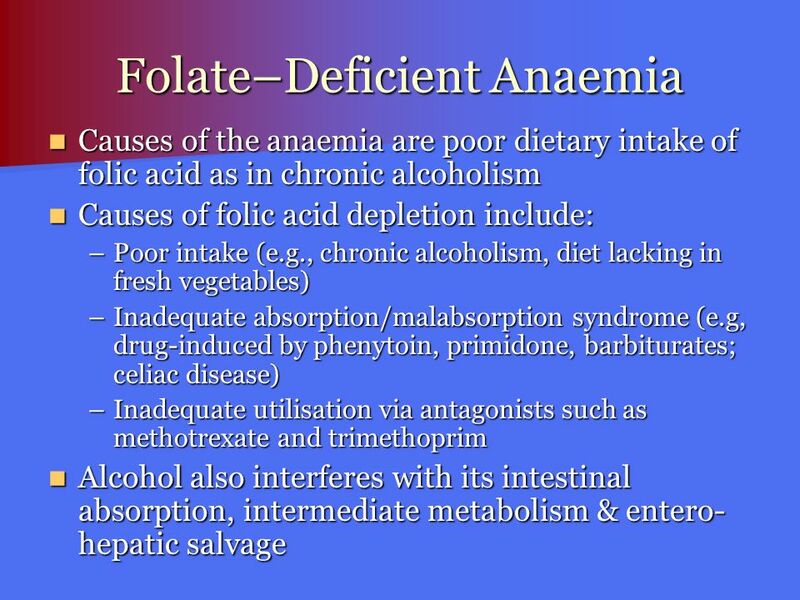 Other findings depend on the severity of liver insult and may include jaundice, splenomegaly, hepatic bruits, collateral vessels, and ascites. 11 Alcoholic Cirrhosis Alcoholic cirrhosis may occur before, concomitant with, after, or independent of a bout of alcoholic hepatitis Characterized anatomically by widespread nodules in the liver combined with fibrosis Most common of specific organ damage in alcoholics The clinical history is similar to that of alcoholic hepatitis, & symptoms are similar to those observed with other forms of end-stage liver disease Alcoholic cirrhosis may occur before, concomitant with, after, or independent of a bout of alcoholic hepatitis. 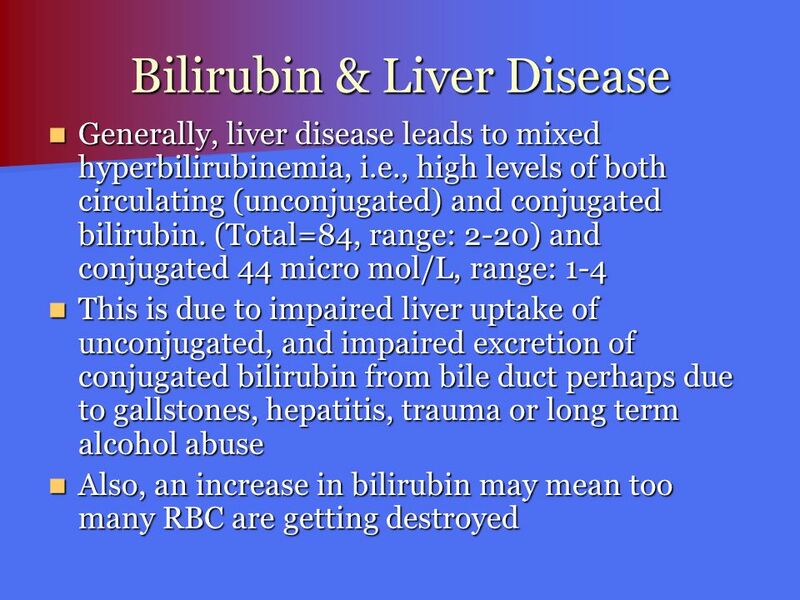 The clinical history is similar to that of alcoholic hepatitis, and symptoms are similar to those observed with other forms of end-stage liver disease. 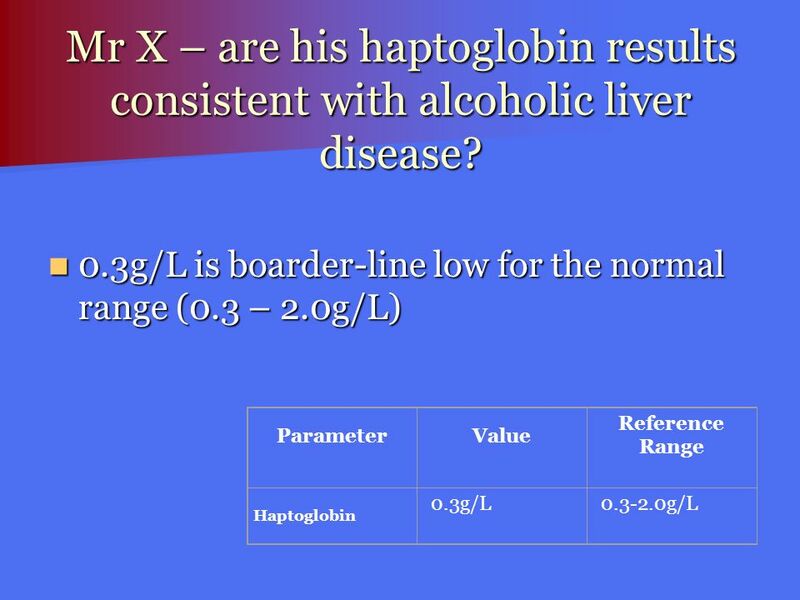 22 Mr X – are his haptoglobin results consistent with alcoholic liver disease? 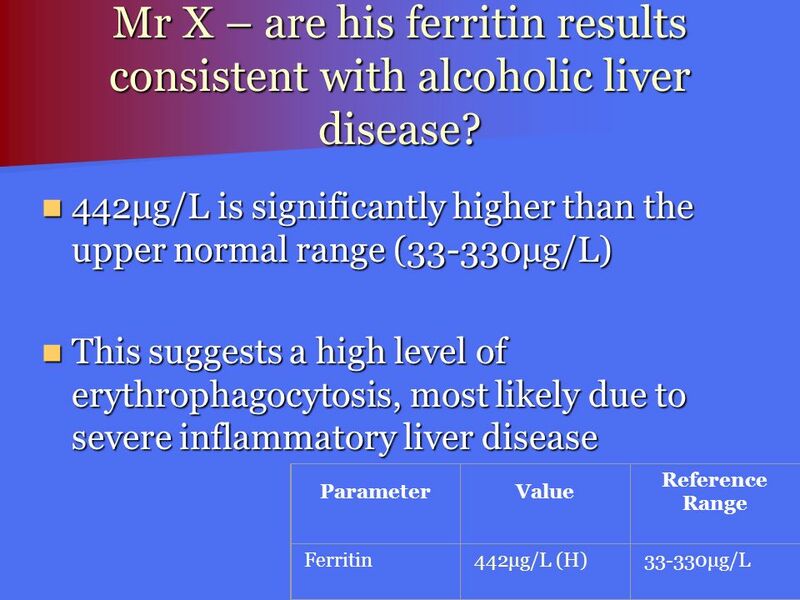 25 Mr X – are his ferritin results consistent with alcoholic liver disease? 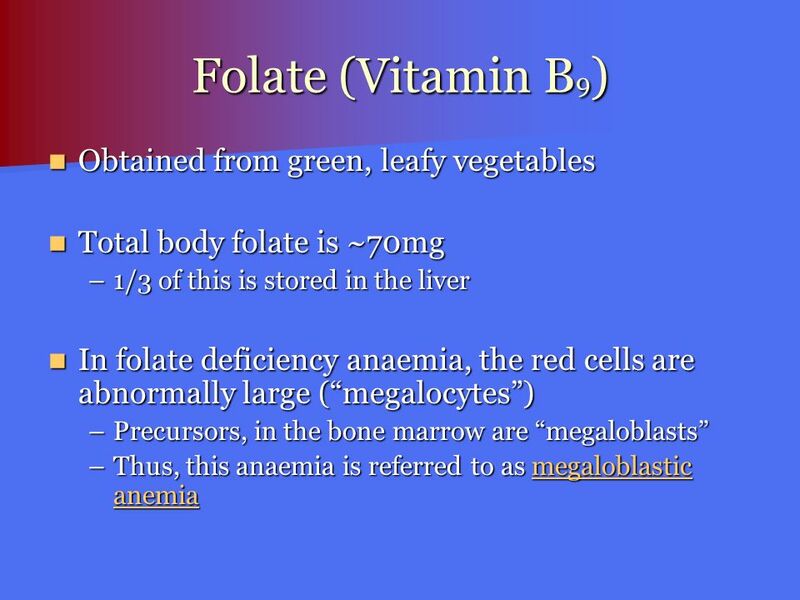 Total body folate is ~70mg 1/3 of this is stored in the liver In folate deficiency anaemia, the red cells are abnormally large (“megalocytes”) Precursors, in the bone marrow are “megaloblasts” Thus, this anaemia is referred to as megaloblastic anemia Polyglutamate folate is the most common form of folate in food Reduced to dihydrofolate and tetrahydrofolate They are bound to protein and transported as methyltetrahydrofolate. 28 Megaloblastic Anemia Results from defective DNA synthesis. RNA synthesis continues  increased cytoplasmic mass & maturation I.e., All cells have dyspoiesis: cytoplasmic maturity > nuclear maturity  production of megaloblasts Dyspoiesis  increased intramedullary cell death  hyperbilirubinemia & hyperuricemia All cell lines are affected, so leukopenia & thrombocytopenia may occur Main causes: defective utilisation of folic acid or vitamin B12 deficiency; cytotoxic drugs; Di-Guliemo Syndrome Di-Guliemo Syndrome: rare autonomous neoplastic disease which sometimes converts to leukaemia. 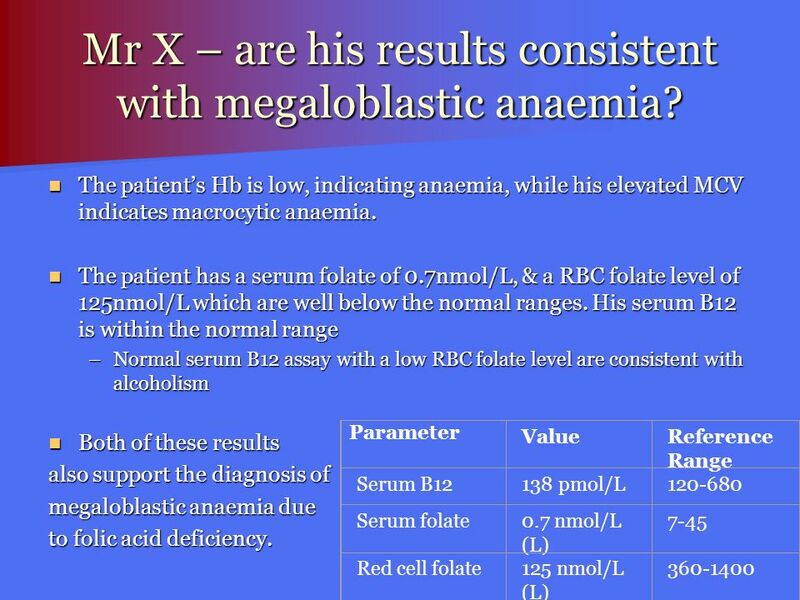 29 Mr X – are his results consistent with megaloblastic anaemia? 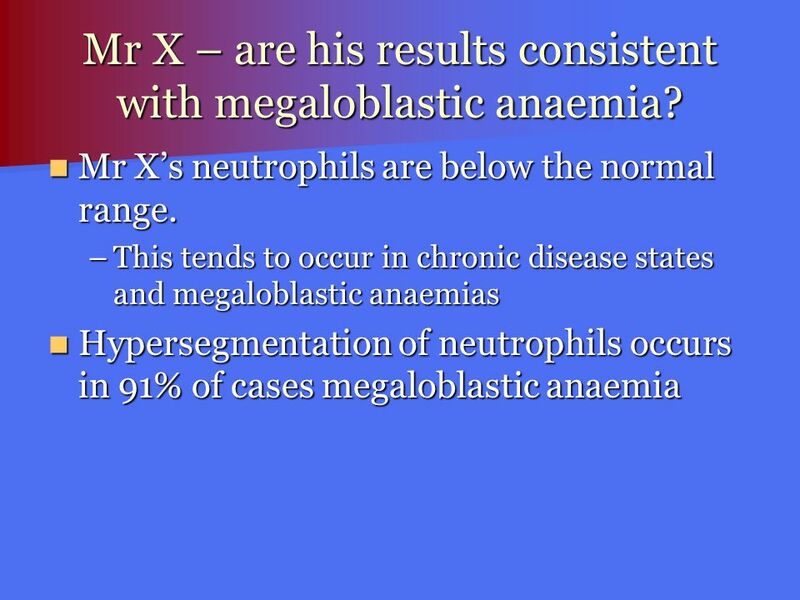 31 Mr X – are his results consistent with megaloblastic anaemia? 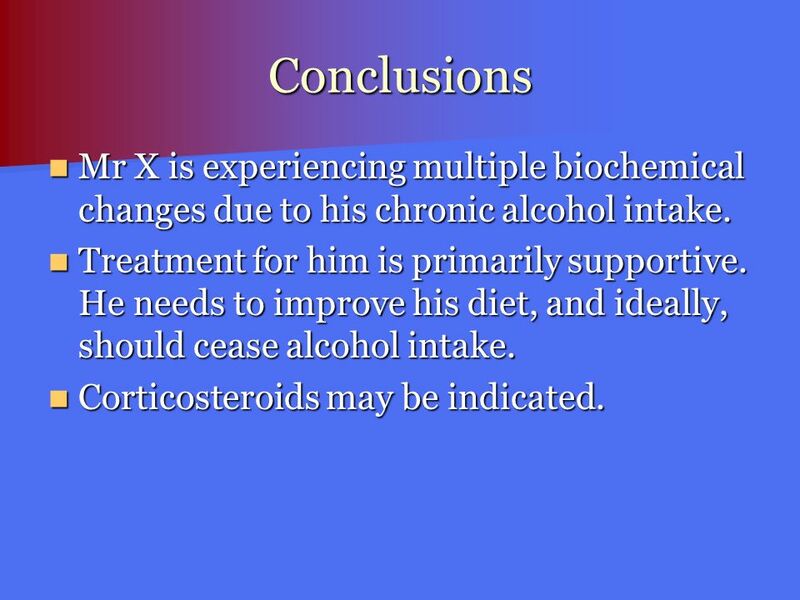 32 Conclusions Mr X is experiencing multiple biochemical changes due to his chronic alcohol intake. Treatment for him is primarily supportive. He needs to improve his diet, and ideally, should cease alcohol intake. Corticosteroids may be indicated. 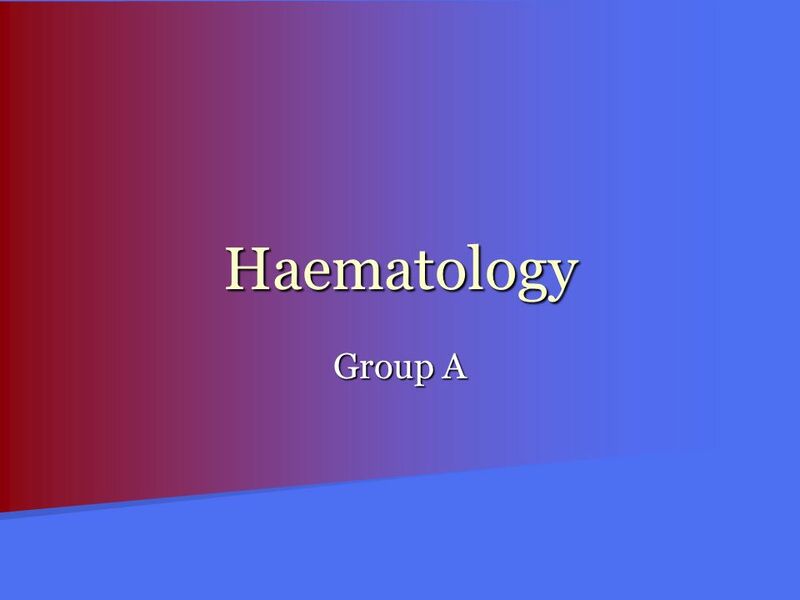 Download ppt "Haematology Group A." YOUR LOGO HERE Department of Haematology, Collegium Medicum Jagiellonian University, Kraków, Poland Anaemia Prof. A. B. Skotnicki M.D. Ph.D. 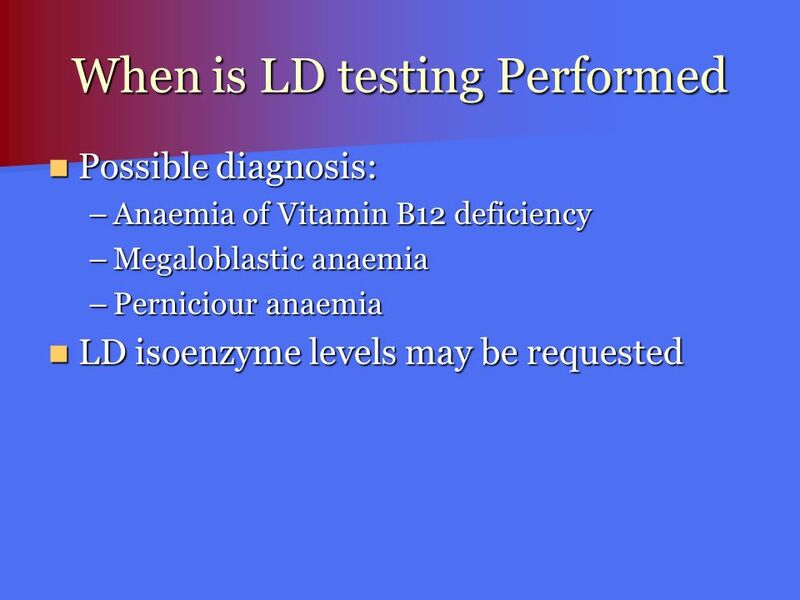 CLUES TO THE DIAGNOSIS IN ANEMIA PRINCIPLES 4 Anemia is not a disease 4 There is usually a cause 4 investigation should be logical 4 Start with CBC and. 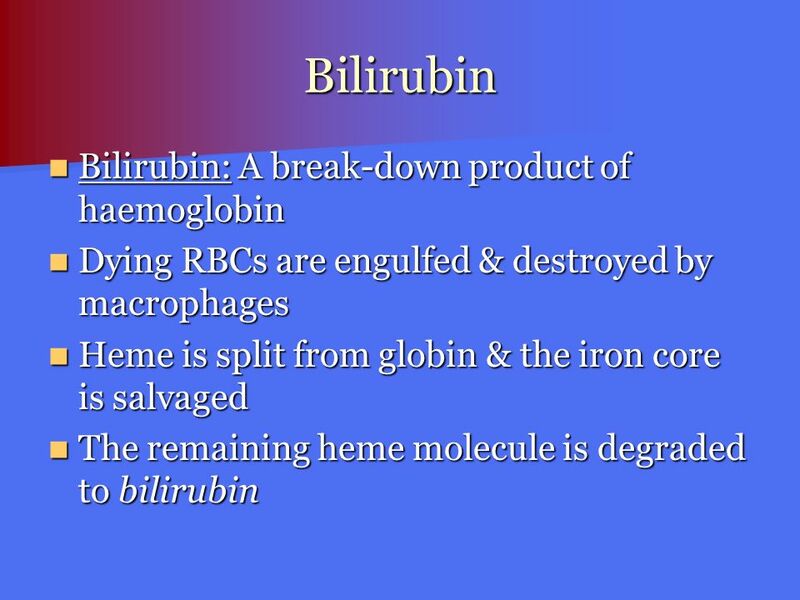 RHY/CH00561 Biology of Disease CH0576 Hyperbilirubinaemia & Jaundice II. 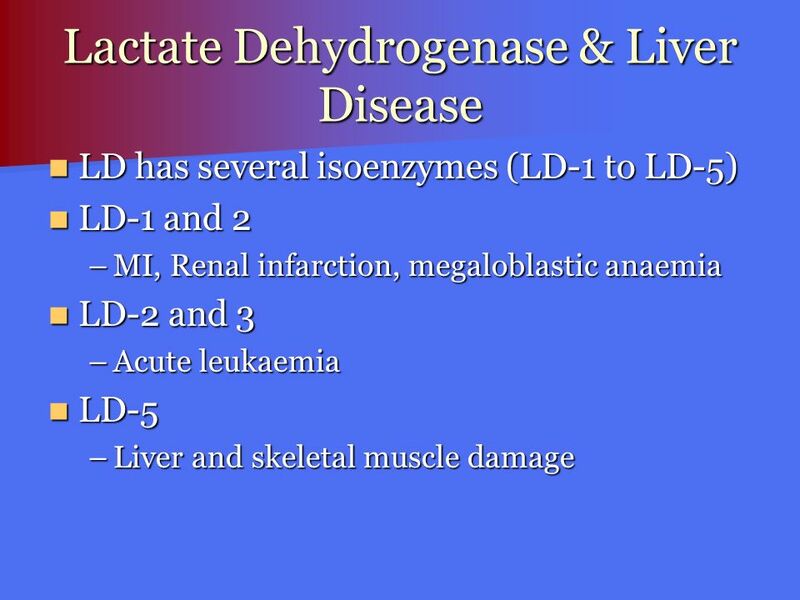 Degradation of heme 1Dr. nikhat Siddiqi. 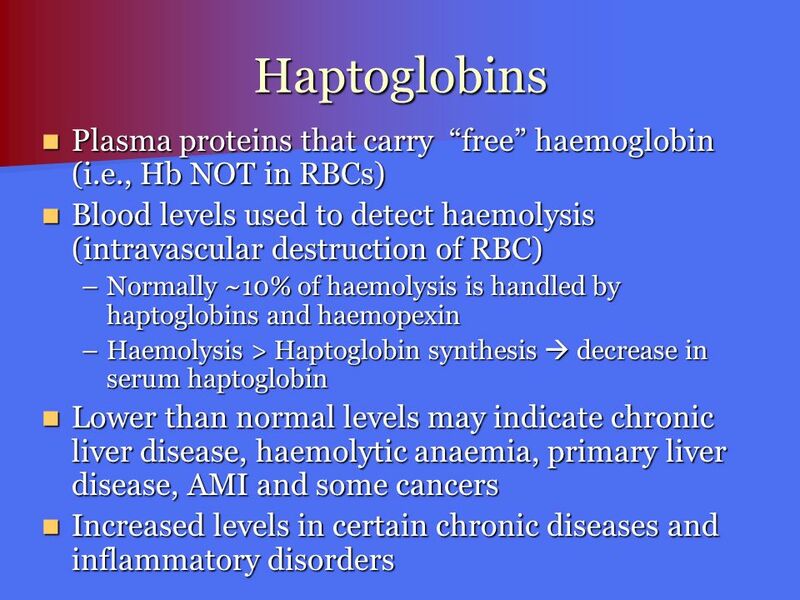 After approximately 120 days in the circulation, red blood cells are taken up and degraded by the reticuloendothelial. Chapter 15 The Liver The liver lies in the upper right quadrant of the abdominal cavity and is the largest organ in the body. 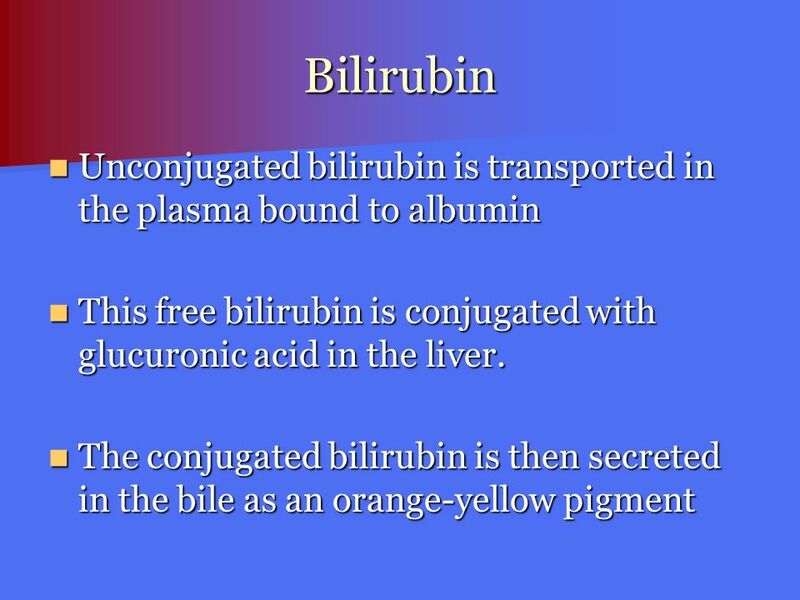 The functions of the liver. 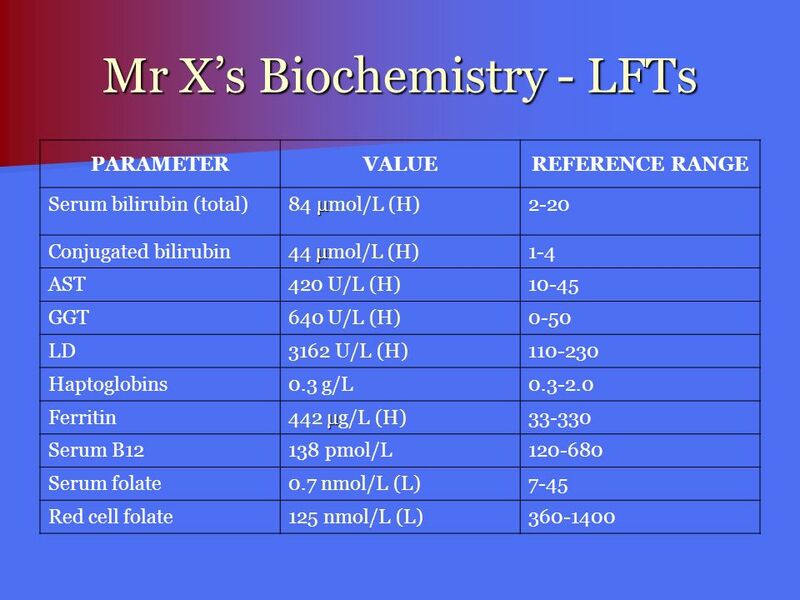 1 CLINICAL CHEMISTRY-2 (MLT 302) LIVER FUNCTION AND THE BILIARY TRACT LECTURE FOUR Dr. Essam H. Aljiffri. 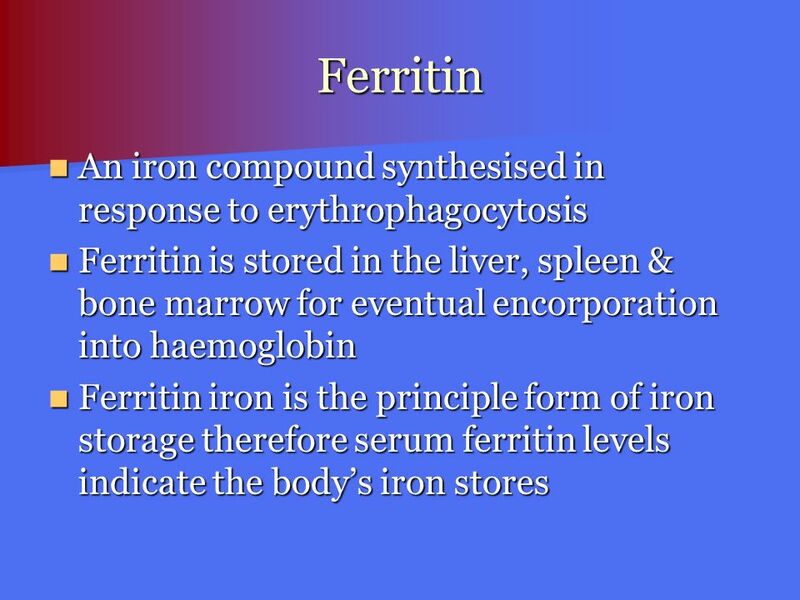 1 CLINICAL CHEMISTRY-2 (MLT 302) LIVER FUNCTION AND THE BILIARY TRACT LECTURE THREE Dr. Essam H. Aljiffri. 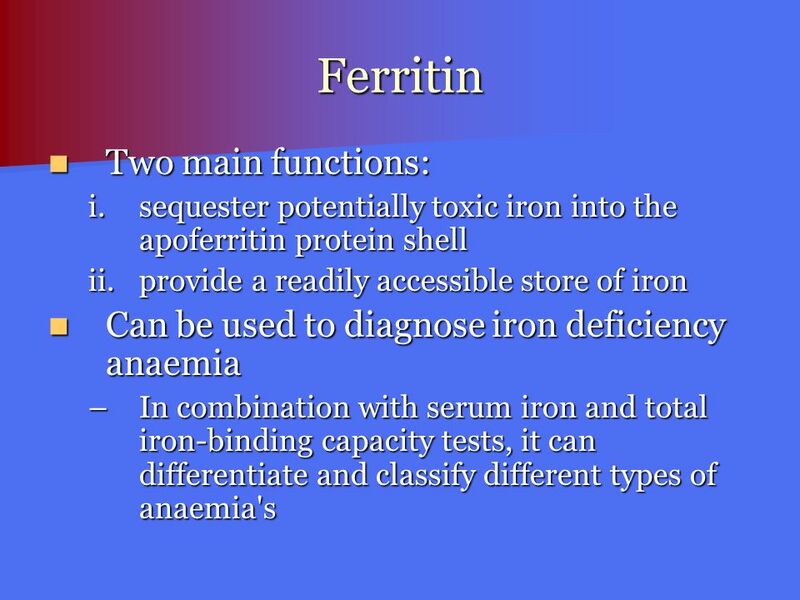 1 Serum Enzymes in Disease Dr. Essam H. Aljiffri. 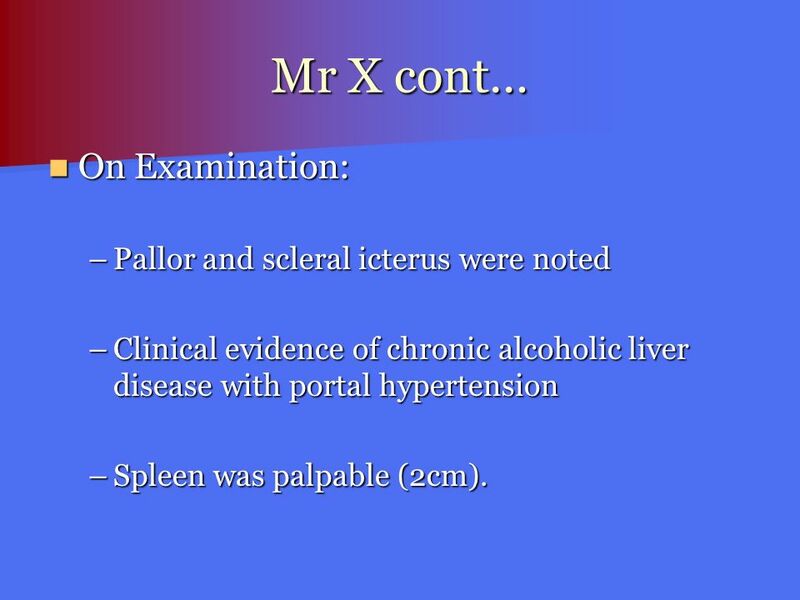 CLINICAL CHEMISTRY-2 (MLT 302) LIVER FUNCTION AND THE BILIARY TRACT LECTURE FIVE Dr. Essam H. Aljiffri. 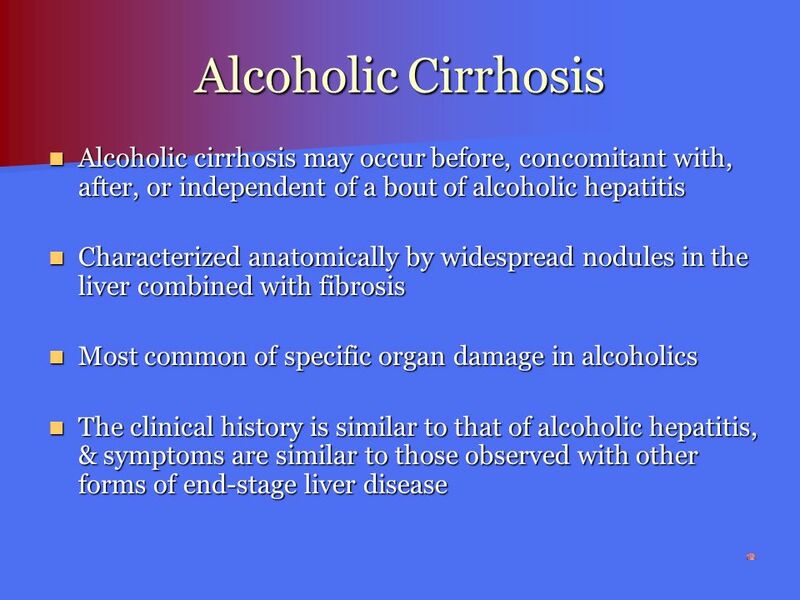 Cirrhosis of the Liver Kayla Shoaf. Chronic hepatitis in childhood Modes of presentation Acute onset jaundice and persisting Gradual development of signs of liver disease Asymptomatic finding. 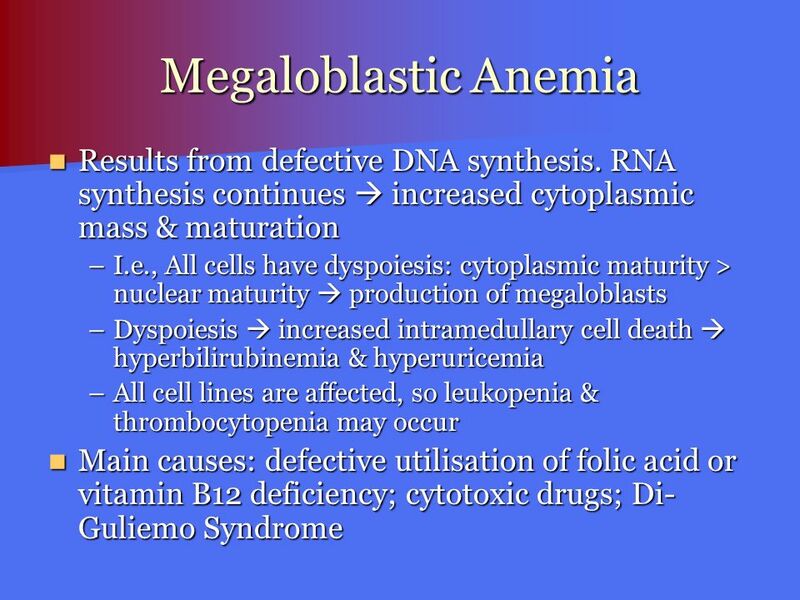 MEGALOBLASTIC ANEMIAS Nada Mohamed Ahmed, MD, MT (ASCP)i.